Liberty Regional Medical Center's Surgical Services Department is an up and coming department that has experienced tremendous growth over the past few years. Regular hours of operation are Monday through Friday from 7:30 am until 4:00 pm, with a Surgical Call Team available for emergencies occurring after hours, on weekends, and holidays. The department includes an ambulatory service area with an 8-bed capacity, a gastrointestinal endoscopic procedure room, 3 operating rooms, and a 3 bay Post Anesthesia Care Unit. The anesthesia team consists of a board certified Anesthesiologist as well as licenced CRNAs. They are responsible for providing general anesthesia, epidural blocks, and conscious sedation. 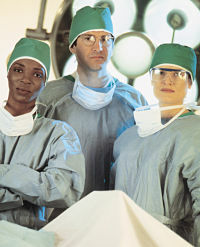 Nurse staffing includes RNs, LPNs, and Surgical Scrub Technicians. Department policies and practices are based on AORN (Association of Operating Room Nurses) guidelines. We are always looking for ways to make Liberty Regional Medical Center better. If you would like more information about our services or anything else you have learned on this site, contact us.